The earth is an ocean planet. Covering 70% of the globe, the ocean absorbs about 90% of the atmosphere’s heat. The world’s oceans interact with the global climate and weather: oceans influence the climate and weather locally and globally; and the climate can change the oceans. This graph shows the amount of carbon dioxide in the atmosphere as of December 22, 2018. As the atmosphere has warmed due to human-driven climate change, the ocean has taken up an inordinate amount of heat. And, that has taken a toll: the ocean is warmer than at any time since we began keeping records in the 1880s. In January 2018 scientists reported that the ocean is warming 40% faster than had been predicted five years earlier. The warming of the ocean has many dire consequences: sea level rise, coral bleaching, decrease in oxygen levels, algal blooms, species moving or dying if they can’t adapt, and changing currents. In addition, the ocean also absorbs 25% of the atmosphere’s carbon dioxide. As the carbon dioxide in the atmosphere increases and the ocean absorbs it, the ocean’s chemistry changes, becoming more acidic. This ocean acidification has impacts on sea creatures. Scientists have been investigating the potential effects over the last 25 years. Many shell-building animals are already showing signs of this stress. Seas are rising around the globe because the earth is warming. There are two contributing factors to the rise: sea water expands as it warms; and ice sheets and glaciers are melting into the ocean. For the past 25 years the seas have not only been rising and the rate of that rise is increasing. 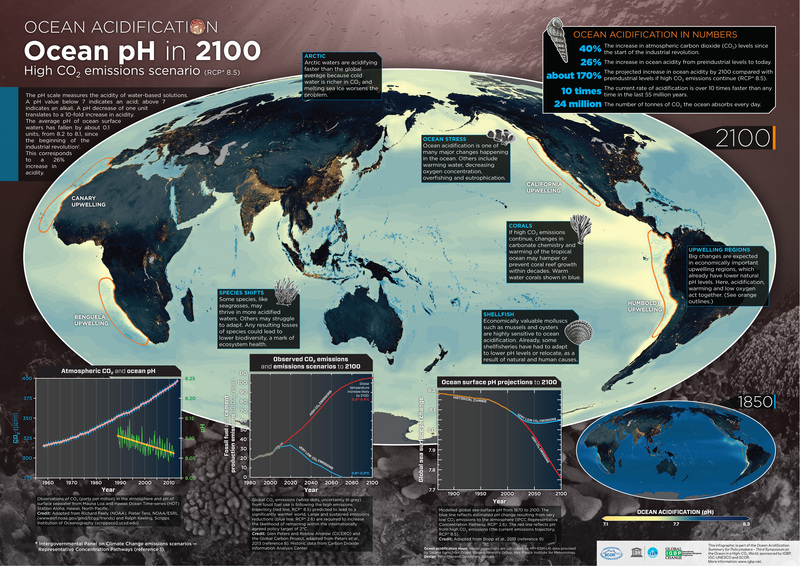 By 2100, the seas could rise anywhere between five inches and 10 feet, depending on what actions we take. A good animated introduction to sea level rise. A primer on sea level rise. Satellites can measure sea level rise from space. And you can see a visualization of sea level rise measurements over a 22-year period. If you live on the coast, you can find a place near you to see how much the sea will rise and the risks associated with it. If you’re not near the coast, you can find a place of interest anywhere in the world. Coral bleaching is caused by higher ocean temperatures, which starve the coral reefs of their main food source, microscopic algae. When the ocean is too warm for the symbiotic algae that live in coral tissues, they leave the corals or die – a process called bleaching. The frequency of coral bleaching is increasing. In the past, coral reefs bleached every 25 to 30 years. Since 2010, that timeframe has shrunk to six years. By early 2018, the Great Barrier Reef alone has bleached four times since 1998. Some coral reefs can recover if there’s enough time between bleaching events. But if corals can’t adapt quickly enough, “we could be looking at the effective loss of most of the world’s coral reefs,” said Mark Eakin, an oceanographer who is coordinator of the Coral Reef Watch project at the United States National Oceanographic and Atmospheric Administration that looks at loss of world's coral reefs. You can see images of healthy and unhealthy reefs here. Graphic courtesy of Matthew Long, NCAR. The decline in oxygen is already happening in some places and will get worse over the coming decades. As oceans heat up, they hold less oxygen than cooler water. In the open ocean, global warming is the main cause of declining oxygen. Direct measurements show the amount of oxygen in the global oceans has decreased by around 2% over the past 50 years. Oxygen is fundamental to biological processes in the ocean. Its decline can cause changes in biodiversity, productivity and nutrient cycling. When oxygen decreases, there’s a loss of habitat for organisms that can’t handle the change or can’t move to where oxygen levels are higher. Some coastal areas have such low oxygen concentrations that species distributions are limited and populations are declining. Scientists have found that warm water and lower oxygen levels would change the distributions of species like cod, rock crab, and eelpout. Some fish species are moving up towards the surface where there’s more oxygen, but where there are also more predators. In addition, scientists have found that oxygen minimum zones in the open ocean have expanded. The oxygen minimum zone becomes a barrier for animals that vertically migrate and can’t survive long enough in low oxygen to make it to the surface. It also creates a smaller living space for those animals that live above the minimum zones. The oxygen decline in coastal areas is a result of the combination of increased nutrients flowing into the ocean and climate change. In extreme cases the oxygen level is so low it creates a "dead zone" with many animals dying. This blog from Oceana provides a good overview of the affect of climate change on declining oxygen in the ocean. Scientists have shown that rising ocean temperatures caused by human-induced climate change have already driven an intensification of harmful algal blooms (HABs). Harmful algal blooms (HAB) have been in the news for several years now. They occur when nutrient pollution from land reaches the sea or freshwater, fueling runaway growth of algae that can use up all the oxygen. Algal blooms are most often the result of run-off from fertilizer applied to farmlands, or livestock or human wastewater runoff. The blooms can produce toxins that when large enough can kill marine life from tiny to very big. In the fall of 2018, a red tide of a toxic algal bloom covered much of the west coast of Florida. The algae (Karenia brevis) produce a neurotoxin known to kill fish and other animals. Florida resource managers estimate that about 267 tons of fish, manatees, whale sharks, and dolphins were killed by this bloom. Such intense blooms can cause problems for human health and tourism as well. On the west coast, Dungeness crab fishermen have suffered economic losses because toxic algae blooms have made the crabs unsafe for human consumption. The crab fishermen are blaming a warming ocean caused by climate change for the algae bloom and the closure of the fishery. They are suing fossil fuel companies for damages on behalf of crab fishers, their businesses and families, and local communities in California and Oregon. Fish in waters that have warmed are moving toward higher latitudes to stay in their preferred temperature. But, the ocean doesn't warm uniformly, so local conditions drive fish as well. In some places, there may be pockets of cooler water south, so fish move there. For example, in the Gulf of Maine, some species are moving southwest and closer to shore to find cooler waters. This report has good graphics about species on the move. A warmer ocean isn’t a problem for all species. As the oceanic food web shifts, cephalopods are adapting and thriving, becoming the dominant species in many places. Sea star wasting disease has decimated more than 20 species of sea stars on the west coast, including the iconic sun star. Although many factors seem to contribute to the disease, scientists found that the times and locations of the biggest sea star death tolls coincided with the presence of abnormally warm water. Scientists are making the connection between climate change and changes in ocean circulation. The global system of deep-ocean circulation is driven by temperature and salinity. Scientists think that ocean circulation is slowing in the Atlantic ocean because of climate change: evidence shows it has slowed by about 15 percent since the middle of the last century. Cold freshwater from melting Greenland ice is probably the main cause. This water disrupts the ocean conveyor belt at a delicate point, where the cooled surface water starts sinking. Ocean circulation is a major factor driving weather patterns. Slower circulation in the Atlantic means higher hurricane risks, hotter summers in Europe and changing rainfall in the tropics. Warming oceans alter the patterns of ocean circulation in other ways: warmer surface layers slow the mixing of nutrients from deep water so there is less fertilizer for marine algae near the surface. The microscopic marine algae provide oxygen for the Earth’s atmosphere and form the basis for ocean food webs. The increasing amount of carbon dioxide dissolved in oceans is leading to more acidic seawater that is harmful to many kinds of marine life. Sometimes called climate change’s “evil twin,” ocean acidification poses a critical threat to shell building organisms: they make thinner shells and the shells of some species are actually dissolving. Some animals that use calcium carbonate to build shells and skeletons face challenges. Pteropods, free-swimming sea snails called sea butterflies, are often the primary zooplankton at the base the food web in arctic and subarctic waters. These animals may be unable to maintain shells in waters with less available calcium carbonate. Scientists are already seeing pteropods with damaged shells. This is also true for coral reefs, which are made of calcium carbonate skeletons. To make their skeletons, corals need two ingredients: calcium ions and carbonate ions. Acids react with carbonate ions, in effect making them unavailable. As the ocean absorbs more carbon dioxide, carbonate ions become scarcer. Corals have to expend more energy to collect them, reducing their ability to build their skeletons. This changing ocean chemistry will reverberate through every coastal and marine ecosystem. Ocean acidification is affecting shellfish in our diet. Oysters, mussels, scallops, and other shellfish need calcium carbonate to build their shells. With increasing acidity, the shells are thinner, growth is slower and death rates rise. Oyster farmers in the Pacific Northwest are already seeing problems with shell growth in young oysters. The ocean’s increasing acidification will change the way we eat. Since the industrial revolution, ocean acidity has increased about 30% and it is expected to increase by 100-150% by 2100 if CO2 emissions continue in a business-as-usual scenario. Images of animals affected by an increasingly acidic ocean. A real life laboratory to study effects of acidification in the future. The Smithsonian has a thorough, informative portal about ocean acidification.